I asked a friend of mine a few weeks ago if I could have one of his models to paint. I didn't want to go out and buy a whole box just to paint one guy for fun. I've always though these guys were cool looking and I might add some of them to my army if I ever get it built. I really wanted to see if I could paint him up and keep him muted. You usually see the flames really bright and high contrast on the model. I wanted to keep this guy really subdued overall. 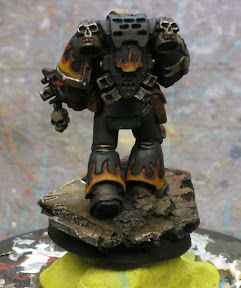 I started by priming him black and working through the flames first. I started with a dark red and worked my way up to a orangish brown color. I gave the whole thing a wash of Baal Red and then added the final light brown color again along the edge. With the flames finished, I moved onto the black. I've always loved the P3 color Coal Black. It just looks so cool to me. I wanted to try it out on this model to see how the blues would look in relation to the flames. I wet blended it into the black as the highlight. I picked out his helmet and all the "bone" stuff with some muted tans. I did push the front portion of his helmet a bit lighter than everything else to draw attention to it. I kept the metals on the model really dark. I gave them a slight highlight, but wanted to show them as being aged and not really clean. With so many dark colors on the model, it was a little tough trying to find subtle variations in hue that I could use to help differentiate between things. 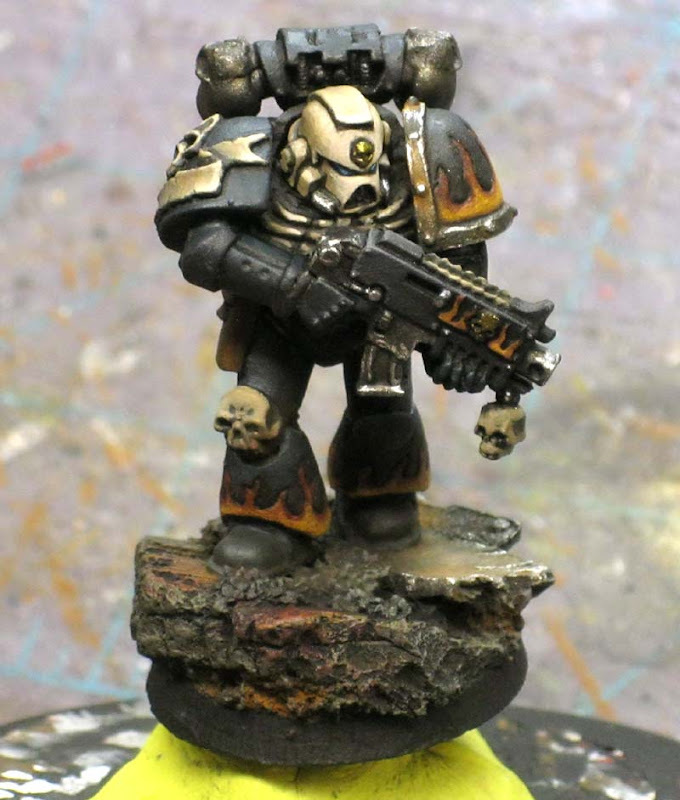 Like his gun, it's a dark grey highlight as opposed to the Coal Black color of the armour. All in all, I think he came out pretty good. I like the fact that he is very dark overall as I think it fits with the feel of the Chapter. His base was the one last place I tried to give him that dark, destroyed feeling. It's a resin base, but I don't know who from since it came on the model when I got it. It's a nice mix of rubble and metal. There's a lot going on here though. I tried to pick out some colors I though would help pull the model and the base together instead of setting them apart like I normally do. 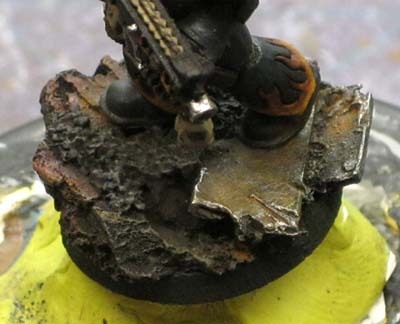 The metal areas were given a number of washes to make them look old and dirty along with some selective weathering with powders to pull the model and base together. In the end, he was a fun model to paint and a nice change of pace for the day. Wow, this looks freaking amazing man! I've got a LOD themed army on the back burner, but it makes me sad knowing they won't look this badass, lol. The Fabricator: You could do this to your models. It's easier than it looks. Hi, having just returned to the hobby having done it when I was younger I'm loving this site. It was the LOTD novel that got me back, along with the Necron characters. Could you expand on how you did the flames? Such as what techniques and how/when they are used? I've had a shot at wet blending, but I'm not doing the models until I'm happy with what I can produce. Anon: The flames were done to keep in line with the dark feel of the model overall. They aren't really wet blended as much as they are layered. I just kept the colors close so that the transition is somewhat smooth. I started with a dark red and blocked out the whole area. You can use any combination of colors that suit your tastes. A quick test model would let you know how the scheme will work out. After I had the red down over all the flame area, I moved onto a slightly lighter orangish-brown color. Instead of moving to a pure orange and then to yellow, I kept it "muddy" so to say. I wanted the flames to contrast in color but not be very light in value compared to the armour. Adding the orange, I left a little bit of red showing at the tops of the flames. I kept repeating this process with lighter and lighter shades of orangish-brown until I had the flames as bright as I wanted them. I think it was another layer or two. Then, to tie it all together and darken it back down slightly, I gave the flames a slightly thinned wash of GW red.